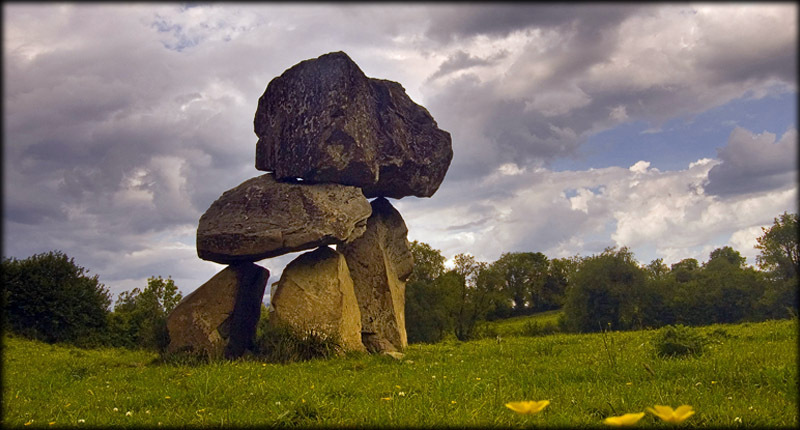 In Aghnacliff, Co Longford, stands quite possibly the most unusual looking dolmen in Ireland. On your approach to the dolmen it looks as though someone has been balancing huge stones one on top of the other. As you go around the portal tomb the form and shape appears completely different from each side. In the picture on the left the portal tomb reminds me of a giant poodle. 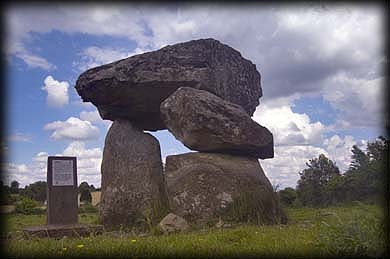 The dolmen has two capstones, one balancing on the other. The largest is about 3 metres long and around 1.5 metres thick and is resting on the other capstone and one remaining portal stone. Just for curiosity alone this tomb is well worth a visit. Situated: From Aghnacliff Church head towards the centre of the town. After some 100 metres you will come to a lane way with a wooden gate. Follow this lane way through this gate and go to another gate on far side of the field. The portal tomb is through this gate in the field below you. Discovery Map 34: N 263 886. Last visit June 2008.